The role of levels releases the importance of built-in stories. According to tradition, the levels of Jesus’ prime lifetime events are relatively well known. He was born at Bethlehem. The Church of Nativity is found at about 1476 uc above sea level; also the entire ridge east of it – more likely to be identified as the very birth-place ( pp. B-97ff) – holds this same level. He was baptized in Jordan. Sediments from the river are said to have lifted the riverbed at least a couple of cubits – possibly twice that height – during the last two millennia. The level of baptism may have been about –738 uc, quite exactly half of 1476 uc. 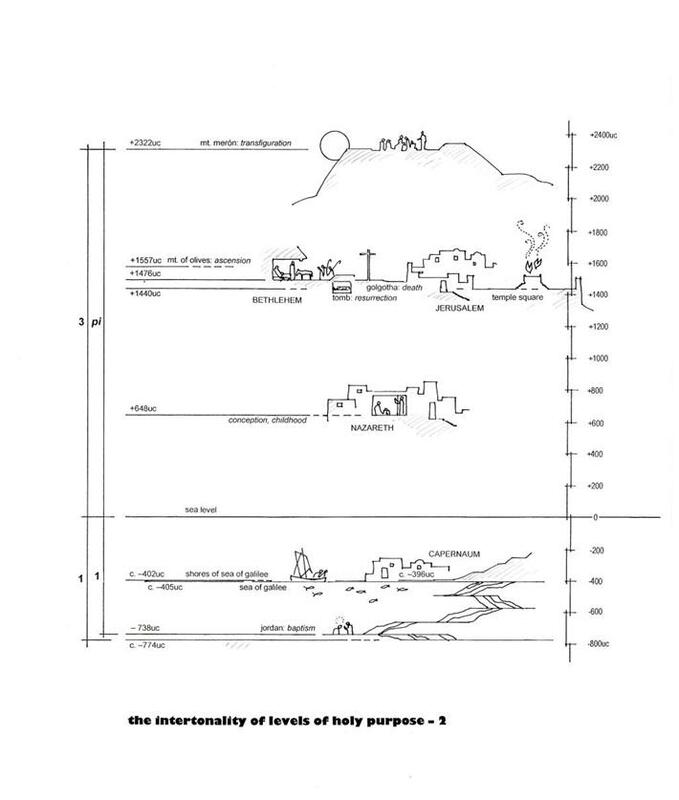 Topography is speaking already, exposing the temple code ratio define the ratio between the two levels. The site of the Church of Annunciation represents the most reliable place of Mary’s home at Nazareth, having the level of +648 uc. Capernaum, once a peaceful fishing town on the northern shore of the Sea of Galilee (at about –405 uc), covered a slope 390 – 402 uc below sea level. I’ve chosen the figure –396 uc, being the approximate level of the synagogue ruins. The place where Jesus was sentenced to death is not known, but the Roman castle, Antonia, which was located at the northern end of the Temple Square, has the privilege of an expressive level: that of the square itself: +1440 uc. The traditional Via Dolorosa, passing along the north wall of what once was the castle, supports the idea. The last place to be included is the mount of Transfiguration – ment-ioned as ‘a tall mount in Galilee’, yet unnamed. There is also good reason to identify it as the mount where Jesus met his friends after resurrection, asking them to be his messengers throughout the world. It’s mainly identified as Mt. Tabor, but the tradition is hardly reliable. The right mountain may prove to be Har Merón, the tallest in Israel. The Pyramid may help explain why it has remained unnamed. Many chapters ago I described of a descending sphere of energy playing the overture to the very appearance of the Great Pyramid. The sphere didn’t make its final halt until the moment of touching sea level, Earth’s zero level. At this position its centre was about 402 uc above this Zero. In other words, its radius would measure 402 uc, the level-to-be of the Great Pyramid’s apex. This was not the only Pyramid level defined by the sphere. At the exact middle between the Pyramid apex and sea level we find the floors of the High Chamber and the Threshold. A ‘sea-mirrored’ Pyramid’s apex would accompany his steps, touch his shoulders, or – his Superior Crown … ( 11). Thus, the imaginary ascending sphere would fit in here too, connecting two One-borne representatives of the Source beyond – the ‘Living Word’ and his silent companion. The Dead Sea surface, the deepest on the planet where you may still breathe, may have had a level of about –774 uc at the time of Jesus. River Jordan’s fall from the Sea of Galilee would thus have had a vertical height of 369 uc. This height dimension is a module in the Yeshúan landscape’s topo-graphy. The levels of –738 uc (baptism), +1476 uc (birth; death), and +4428 uc (Moses on Mt. Sinai), are all multiples of 369 – a triad of digits, being 3 x 123. 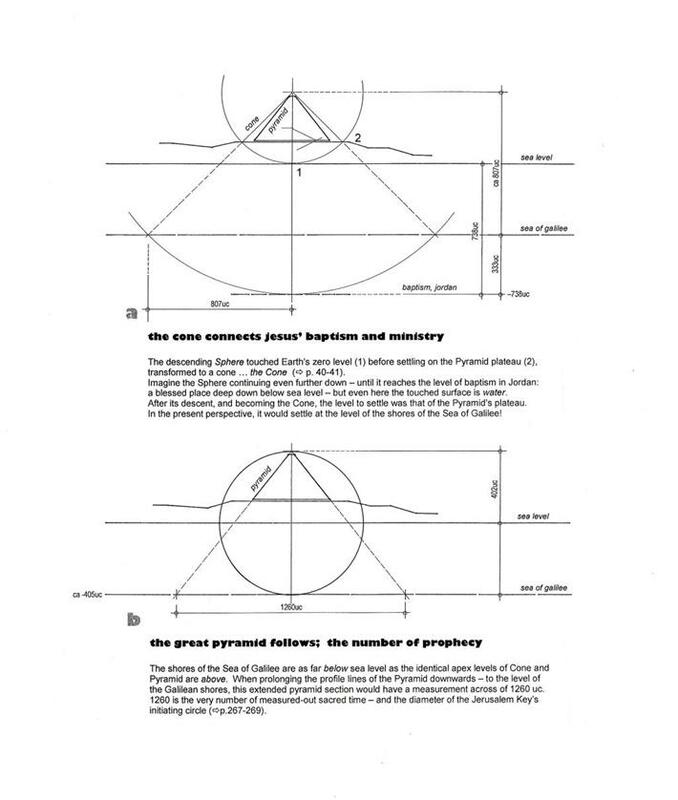 Relating the logometric values connected to Jesus and his key resorts will be topics of a separate chapter, demonstrating how the numbers of Formula D connect with the numerology of sacred measurement ( 12). All these data reflect holy purpose. There is no reason to guess that Jesus knew them, using them as his advisors. He stressed that ‘the Father’ was his very Source, advising him what to say and do. Both the body of the Great Pyramid and the face of the Earth have their zero levels. 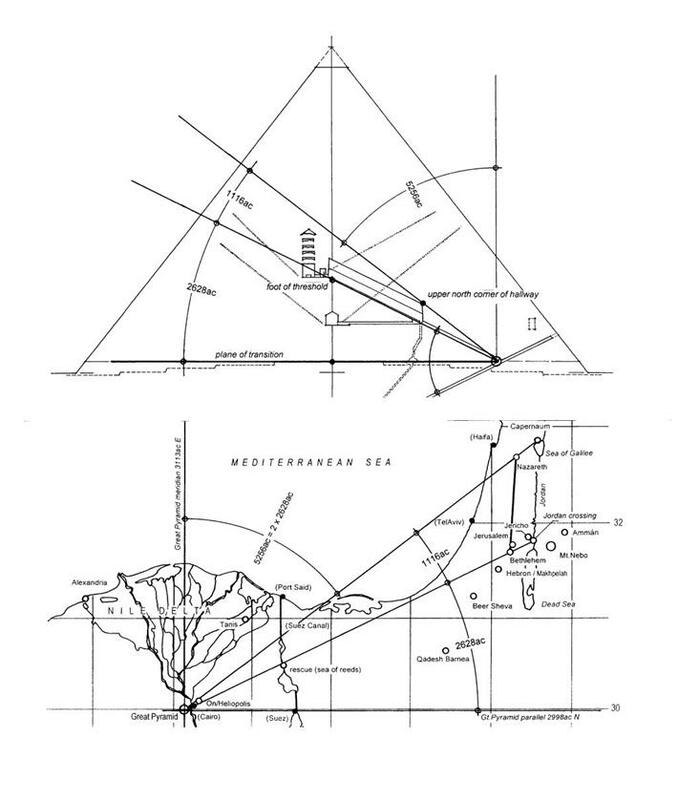 In the Pyramid it’s the level of transition: where the passages meet; on the planet: sea level. In the middle of the Pyramid nature and culture meet: raw rock meets masonry. Two very different conditions. So is it at sea level, too: water meets air. The level of connection is one of radical change. Below this surface you need a snorkel to keep breathing, and a periscope to help orientate. Symbolically, we all belong down there. This may have been one of the reasons why Jesus chose the Jordan depression for baptism as well as mission. Descent demanded that the given zero level be penetrated; that the Holy would head for and reach the bottom. In the Pyramid nothing is more symbolically connected to birth, as well as death, than the High Chamber with its coffer. The floor level is about +73.86 uc. The levels of both Bethlehem and Golgotha are +1476 uc. The ratio is almost exactly 1 : 20. The level of the Middle Chamber floor is about +32.47 uc. The tradit-ional Marian level at Nazareth is +648 uc. The same ratio appears – about 1 : 20. A conclusion seems at hand: this ratio is no mere accidence. The lowest breathing level in the Pyramid is at the bottom level of the pit, –75.98 uc. On the Earth it’s at the Dead Sea surface: about –774 uc. Here the ratio is 1 : 10.187. 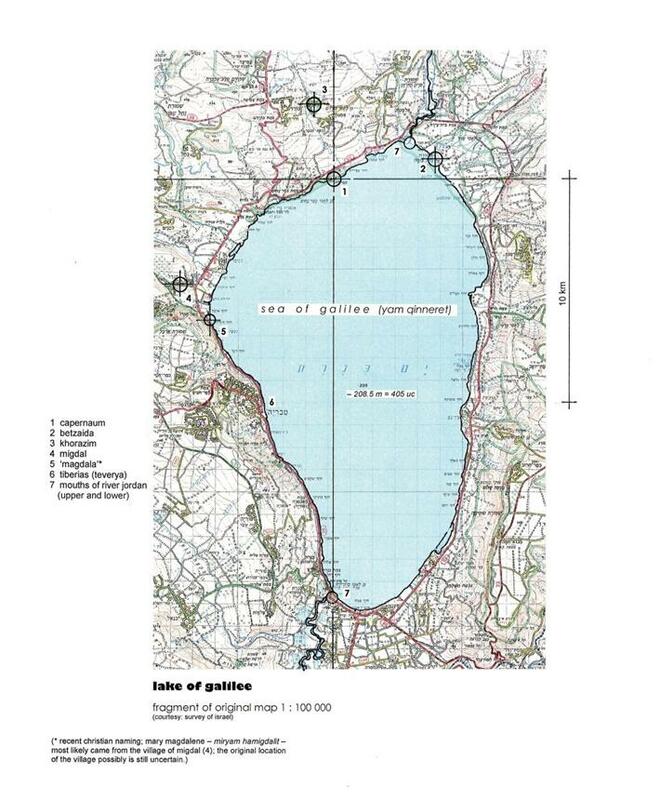 In 2005 it had sunk to –810 uc. At the time of Jesus it may have been about –774. The ratio below the zero levels may thus have been closer to 1 : 10. The rock ledge 2 rc above the pit bottom has the level of –73.94 uc. The place of baptism: about –738 uc. The ratio 1 : 10 is almost correct. You may agree that the above interplays, despite miniscule inaccuracies, are too striking and too precise to be ignored. They show that even the key levels of the Pyramid interior and the Yeshúan landscape reveal a relationship insisting to be read and understood. The ratios may simply refer to the elemental differences of water and air; rock and masonry. The still remaining challenge, however, is that Capernaum is missing. Capernaum was missing. Why? Was a still undiscovered chamber to be found down there? Or is some other feature analogous to a ‘Capernaum’ symbol to be recognized … a quite different interior phenomenon? Or, is the Pyramid’s Capernaum definitely absent? If so: can the entire aspect of interplaying levels be a miss, after all? I was fully certain that ‘Capernaum’ is present. And that it ‘wants’ to be recognized. I tried to see what I still hadn’t seen. Then I came to ponder what all those hidden ‘chambers’ above the High Chamber, mainly explained as a buffer protecting this highly important space, might have to reveal. Four of them having horizontal roofs but no plane floors. And a final, having a ridged roof and still no floor. Suddenly a possible point of meaning appeared: that the entire series was to be regarded aspects of the very High Chamber. If so, all of them had the one common floor, thus exposing an articulation of heights. Conse-quently, I made the Top Chamber’s roof ridge a fixed point. One at the time I made the different ‘chamber heights’ sink like an elevator, down through masonry and continue through raw rock, until the last chamber unit – the High Chamber itself – had reached the ultimate bottom level. What I found was that I had arrived at the Pyramid’s ‘Capernaum’. The level, according to my calculations derived from the survey available, was –39.33 uc. Transferred to the real Capernaum via a ratio of 1 : 20 the deviation from 396 uc would be 2.7 uc or 1.39 m. More or less matching the heart level of a person standing in the synagogue. The Capernaum mystery may reveal that a chamber deep in the rock is still not discovered. Another conclusion seems more to the point: The full meaning of Capernaum is not only to be sought at the shore of the Galilean Sea. It’s also to be identified with Bethlehem and Golgotha – with birth, death and resurrection. In other words: The choice of Capernaum as his center of ministry implies a consistent union with the entire span and the entire meaning of Jesus’ life. No wonder that this was the only of the four cities where his life wasn’t threatened. 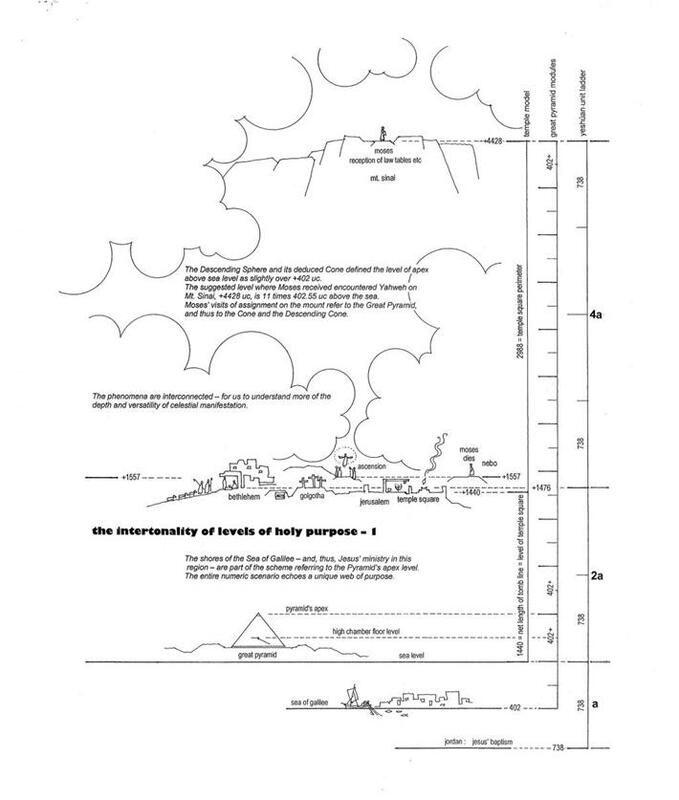 Or that it was the very apex of the map figure heading north-east from the Pyramid via Nazareth ( p. 104a). Jesus had told his disciples to meet him after resurrection. They had possibly forgotten, drowned as they were in their anguish after the execution at Golgotha. The mountain wasn’t named. It was ‘that mount you all know’. It’s the only place of key events which, for some reason, was kept a secret. It has remained a secret ever since. Later tradition chose Mt Tabor (Har Tavór) – most likely a mistaken choice. But how can we know? Myself I once more turned my attention to the Pyramid. What could be a most secret and ‘unnamed’ spatial feature of the Pyramid’s anatomy? 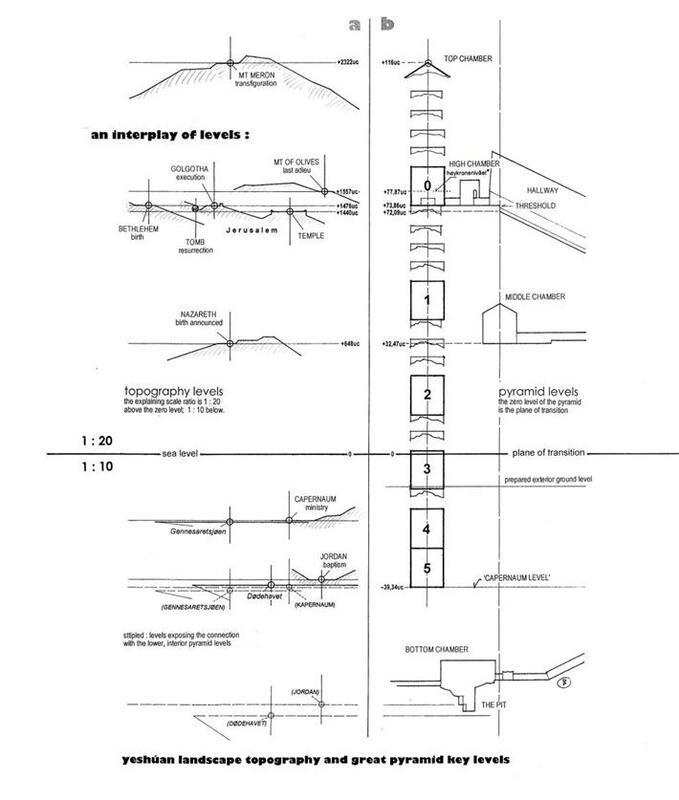 The answer was direct and illuminating: the very roof ridge of the Top Chamber … the fixed reference of the ‘elevator’ connecting Capernaum to Bethlehem and Golgotha. The meeting-place may have been some ten or more meters beneath the very top level. The place is even, according to old traditions, named ‘the Throne of the Messiah’. Jesus has been believed to appear here at the ‘second coming’. Tradition may thus reveal that the holy meeting has been remembered, yet still kept secret and, possibly, given a cover name – for the sake of secrecy as well as of recognition (⇨ inside of back cover). The Top Chamber may prove a most important guide – to make the invisible visible. Only chisel and dynamite opened the access to this most hidden space; poorly paid Arab boys may have covered most of the bill – sore eyes, injured lungs, and shortened lives. The place where the order was made, to make his message known throughout the World, is most holy. The reason why it wasn’t named may refer to this extremely sanctity. The transfiguration, also taking place on an unnamed mount in Galilee, make us guess that the two places are identical. The place is Har Merón. A few Jewish rabbis have been entombed here, but still no Christian tradition has occupied it and disturbed its sacred silence like it’s done in Jerusalem, at Bethlehem and now, during the last decades, at Capernaum, too. The very top has been occupied, however – for observation and defense purposes – but the ‘Throne’ remains a place of peace (⇨ photo; inside of back cover). It’s time to adore this holy place – also by refusing to destroy its sanctity by more or less well-meant sacred edifices. Like the hiding Top Chamber and its roof ridge in the Pyramid, this place on Har Merón, protected and kept secret for two millennia, deserves to remain a holy place of peace. The vertical distance down to the place of baptism in Jordan is 3060 uc, 738 uc below sea level. The interacting dimensions form an expressive Key whose level of transition would be 43 cm above the sea. At the level of your knees when your feet are on the verge of dipping into the Mediter-ranean. Allowing the Dead Sea level to be –774 uc (as suggested: at the time of Jesus), the Har Merón level of +2322 uc makes sea level divide the total vertical span at a ratio of 4 : 1. Another place of solid information is the place of ascension on the ridge of the Mount of Olives. The level is +1557 uc, its altitudinal distance to the Great Pyramid plateau being 1440 uc. In other words, Jesus gave his friends his last blessing where the Pyramid and Temple plateau levels, +117 uc and 1440 uc, are added. What an expressive summing up before leaving! 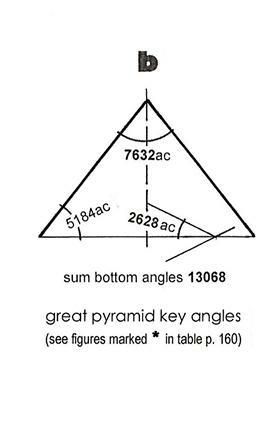 1557 uc is equal to 2628 (pyramid) feet. The symbol of ascent was con-nected with the event of ascension. What an expressive way to announce these sacred connections! Also Moses’s place of taking leave – on Mt. Nebo – is at that very same level. The text is a totality: the Ten Commandments. Four 'vertical' (blues) and six 'horizontal' (reds), plus the introduction, the very signature - naming the One who called the people to Mt. Sinai to give them this holy law. 'Table Five' is a quite different way of presentation, though. Will it reveal new points?